Many programmers code by instinct, relying on convenient habits or a "style" they picked up early on. They aren't conscious of all the choices they make, like how they format their source, the names they use for variables, or the kinds of loops they use. They're focused entirely on problems they're solving, solutions they're creating, and algorithms they're implementing. So they write code in the way that seems natural, that happens intuitively, and that feels good. But if you're serious about your profession, intuition isn't enough. Perl Best Practices author Damian Conway explains that rules, conventions, standards, and practices not only help programmers communicate and coordinate with one another, they also provide a reliable framework for thinking about problems, and a common language for expressing solutions. This is especially critical in Perl, because the language is designed to offer many ways to accomplish the same task, and consequently it supports many incompatible dialects. With a good dose of Aussie humor, Dr. Conway (familiar to many in the Perl community) offers 256 guidelines on the art of coding to help you write better Perl code--in fact, the best Perl code you possibly can. The guidelines cover code layout, naming conventions, choice of data and control structures, program decomposition, interface design and implementation, modularity, object orientation, error handling, testing, and debugging. They're designed to work together to produce code that is clear, robust, efficient, maintainable, and concise, but Dr. Conway doesn't pretend that this is the one true universal and unequivocal set of best practices. Instead, Perl Best Practices offers coherent and widely applicable suggestions based on real-world experience of how code is actually written, rather than on someone's ivory-tower theories on howsoftware ought to be created. 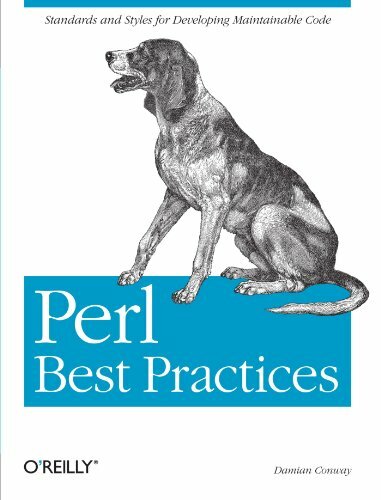 Most of all, Perl Best Practices offers guidelines that actually work, and that many developers around the world are already using. Much like Perl itself, these guidelines are about helping you to get your job done, without getting in the way. About: Presents guidelines on the art of coding with Perl, covering such topics as naming conventions, data and control structures, program decomposition, interface design, and error handling.